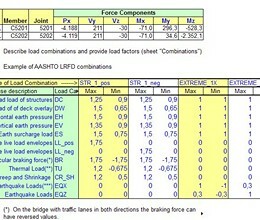 SmartComb finds critical load combinations and maximum/minimum force envelopes for structural members. Using "smart" algorithm it avoids creating unnecessary combinations and saves engineering time cutting off excessive post-processing. Most design codes specify two load factors (magnifying and reducing) in the same combination. If a combination contains 4 individual load cases, then the number of sub-combinations to consider is 2^4= 16, for 8 load cases it would be 2^8=256. Most engineers use logic to specify a reasonably small number of combinations in structural analysis software and request maximum /minimum force envelopes. However, in a complex model an engineer cannot say for sure which sub-combination to disregard, and is likely to miss several critical values and to struggle while obtaining associated forces (e.g. axial force associated with maximum bending moment). SmartComb spreadsheet solves this cumbersome task in a very elegant and efficient way. It finds maximum/minimum forces and keeps track of associated forces without generating large amounts of data required by the conventional approach. 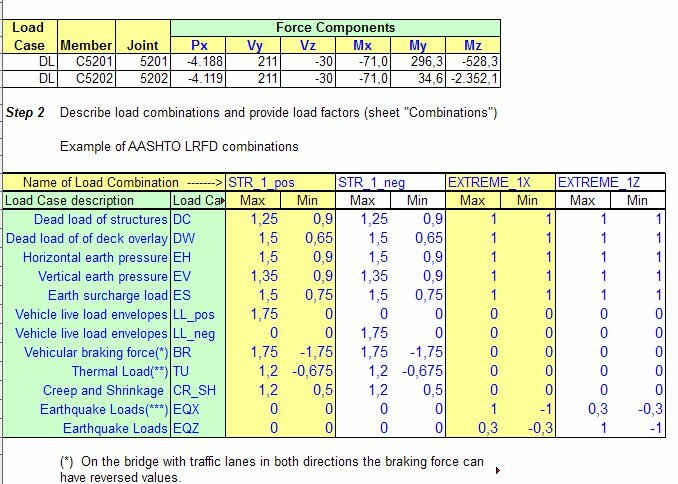 The only input data required are (1) member forces from individual load cases and (2) description of load combinations with dual factors. * SmartComb download link provides demo version of the software. No one has rated SmartComb yet. Be the first to rate this product.